Archimedes has developed a unique method of analysis of potential field data, Energy Spectral Analysis - Moving Window (ESA-MW). This is the principal method used in mapping geological horizons and trends from gridded magnetic, gravity and gradiometry data sets. The Energy Spectral Analysis method applied to magnetic, gravity and gradiometry grid data allows calculation of an average depth to ensembles of the causative bodies. From the slope of the linear segment of the spectrum graph, the depth is calculated. Depth is a function of the decay of the spectrum function within a corresponding frequency interval. A plot of the logarithm of the radially averaged energy spectrum vs the radial frequency from gridded magnetic, gravity or gradiometry data shows the decay of this function which indicates depth to the modelled prism. These depths are unique and are not dependent on assumed or measured susceptibilities or densities. 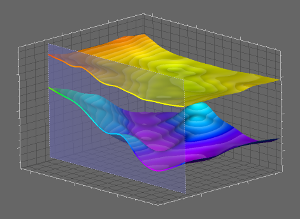 Multiple linear segments (slopes) on the spectrum correspond to separate depth ensembles, implying multiple inhomogeneities. The spectrum graph shown alongside depicts the 1st slope, the steepest, which corresponds to deeper bodies dominating the low frequency zone. The depth value is the average depth to these three deeper bodies. The 2nd slope indicates the average depth to the shallower sources. The areal size of the data set analysed (window) limits the depth being investigated. To determine an optimal window size a 'Multi-Window Technique' is conducted by varying the window size over the same location. For each window the spectrum is computed and using Archimedes proprietary software either in human-guided or semi-automatic fashion, the spectra are interpreted and the depth is computed. Then the spectrum derived depth is plotted vs window size. 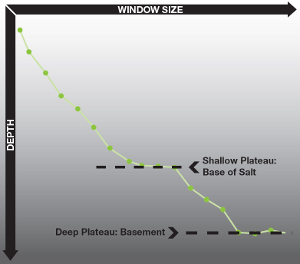 As the optimal window size is approached, the increasing window size detects depths which oscillate around the same value; this is referred to as a 'depth-plateau', on a depth vs window size graph. These depth-plateaus correspond to the magnetic or gravity interfaces (surfaces/sources), where contrasts exist such as magnetic susceptibilities for magnetic data or density for gravity data. The indentification of such depth plateaus indicates the presence of crustal inhomogeneity which may correspond to the basement surface, an unconformity or the top of an intra-sedimentary lithological boundary. The window size is varied to focus on different depths of investigation, small windows investigate shallow depths as the shallow sources produce high frequency anomalies and larger windows investigate greater depths as the deep-seated bodies generate long wavelength anomalies contributing to the low frequency zone. An analysis at a particular location which indicates two plateaus implies two stacked sets of anomalies, indicating two geological interfaces such as the base of salt and basement horizon or a base of basalt and basement horizon. The window of analysis can now be moved around the data set to build up a skeleton depth-grid of the interpreted horizon. The 'Moving Window' process begins with an initial low resolution interpretation (with sparse points of analysis) utilising the results from the MWT. This procedure can be run fully automatically; however it is always also carried out manually to establish a credible geological model. The results can then be gridded and mapped for quality control, including comparisons against other geological or geophysical information, such as well or seismic data. The skeleton depth-grid is then in-filled through various iterations of spectral interpretation, in order to produce a high resolution map of the surface. During this interpretation process the map view window is continually monitored. High resolution interpretation is however dependent on the line spacing of the acquired data. The objective, independent depth solution obtained from the spectra decay and this high density analysis (fine depth-grid) is what differentiates the Archimedes approach and produces the finalised high resolution map of the geological horizon. The same process is repeated for the deeper horizon or lower frequency anomalies, indicated by presence of the second plateau. The final product, a structural depth map of the two horizons, is produced. When multiple plateaus are seen the multiple horizons are imaged. The high effort approach (fine depth-grid) distinguishes Archimedes from other companies using conventional modelling techniques. Archimedes seeks to extract the full high resolution information gathered in the acquisition phase in their processing and interpretation phase. Greater effort produces higher resolution results. An example from the Middle East, shown below, presents the low and high resolution results from the same data set. The high resolution results show much greater detail of the area, compared to that of the low resolution results. A small high can be seen in the top centre of the high resolution image however it was not detected by the low resolution interpretation. This could possibly be an isolated closure and potential lead. The output from Energy Spectral Analysis (ESA) and its various refinements are delivered in a geoscience work station compatible format. This enables our clients to further integrate the results into their sub-surface mapping projects.